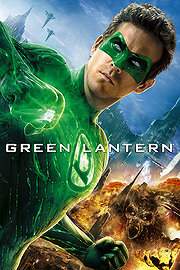 Green Lantern, based on the long-running DC comic, suffers in large part from a script overstuffed with plotlines condensed to clichés, and thinned-out characters salvaged, barely, by capable actors. As a result, the zero-to-hero formula, done with greater success and exuberance in the shamelessly fun The Sorcerer’s Apprentice, never takes off to giddy altitudes. Surely there should some flicker of exhilaration in the notion of a reckless test pilot inducted into a galactic police force and entrusted with a quasi-magical ring that can realize anything he imagines. Yet despite Martin Campbell’s prior success with the Bond franchise’s arguably best outings, he can’t coax much emotion or suspense out of the script, drowing what action scenes there are with yawning stretches of derivative exposition. The film’s primary villain, a billowing smoke Cthulu named Parallax, is massive not in menace but in special effects. And for the wonder we should experience at the multitude of alien races that make up the Green Lantern Corps, there is only a dulled sense of interest. What sinks the film, however, is the fundamental hokeyness of the premise, which doesn’t lie in the premise of a galactic police force empowered with incredible alien technology, but in the cartoonish insistence of using emotions as sources of energy. Hence, the Green Lantern’s rings are powered by courage and willpower, while the film teases with a yellow ring powered by fear. A glimpse through Wikipedia reveals that, in the comics, there exist in the DC Universe other lantern corps with rings powered by various emotions. It’s silly and unscientific, highlighting Green Lantern as juvenile wish fulfillment instead of credible space operatics. In failing to either translate or transpose the comic to film, the result is curiously lifeless. Lifeless, however, would not be an apt description of Ghost Rider: Spirit of Vengeance. 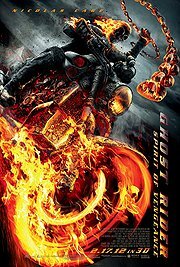 The film explodes with the life of a campy action film, chock-full of over-the-top performances and the unapologetic exploitation of the ghost rider’s magnificent character design, which is that of a fiery skull-headed biker wielding chains that burn evil-doers into puffs of ash. That the film lacks everything that makes a film good – a sensible script, credible drama, and coherent direction – certainly results in a missed opportunity. But every time Cieran Hinds, playing none other than the Devil, uses his marvelously expressive face to offer a sneering frown, or Nicholas Cage tries to outdo himself in his uniquely spastic brand of scenery-chewing, we are reminded about the virtue of a B-movie: the ability to have fun despite the lack of technical acumen. Of course, it’s no surprise to learn that the film’s messy character concept and ludicrous theology has its roots in a comic known for an inability to fit substance to style. Developed on its own, the comic’s imagery presented the epitome of bad-assery but, apparently, never succeed in generating a workable dramatic concept. We can forget, then, both transposition and translation, along with the notion of reinventing the care concept at the cost of fidelity. But we can enjoy a film that celebrates its goofiness and, consequently, delivers a more entertaining experience than dullards like The Green Lantern.